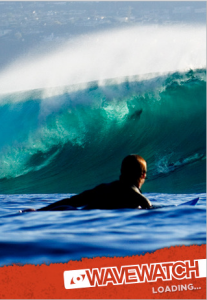 Wavewatch.com is a website dedicated to providing surfers with reports and forecasting of beaches around the world. They aren’t as popular as Surfline, but have very similar features. They have live cams, forecasts, surf-news and videos. They even have an iPhone app. 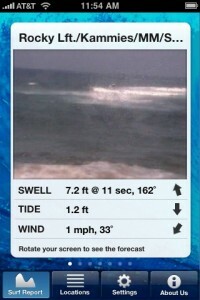 Last week I purchased the WaveWatch application hoping to have a great surf app. Although the reviews on the app store weren’t the best (3 out of 5 stars), I decided to purchase it. After playing around with it for over a week, I see why it isn’t a 5 out of 5 application. The picture on the left is a screenshot of the app off my iPhone. Notice the sea spray making it difficult to see. Also how hard it is to tell that the waves are ” 7 feet ” with how small the cams are. Cams should be shown in landscape mode. In all, the biggest downfall of this iPhone app is that the live cam locations are limited and the cams that they do have are very small and often covered in sea spray. There are better ways to check the surf and if you have a Surfline Premium Membership, they have an iPhone Internet page that works really well. Keep checking in for that review.